Good morning Donna! 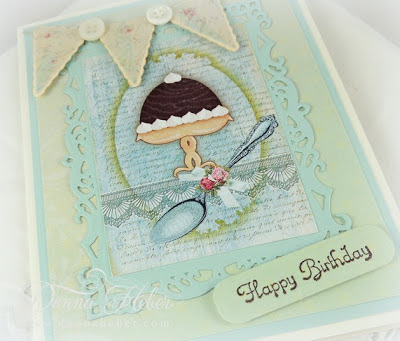 WHat a lovely cake card and the colors of your blog and designs are so calming. Thank you ever so much for dropping by to leave a comment! I too do some art, having sold on Etsy, but I am pursuing my writing as well. A gorgeous card Donna. The image panel is beautiful - it has so many pretty layers to it. I love the soft colours and the Spellbinders frame is one of my favourites; it always looks so stunning. Oh Donna- I love how that turned out! 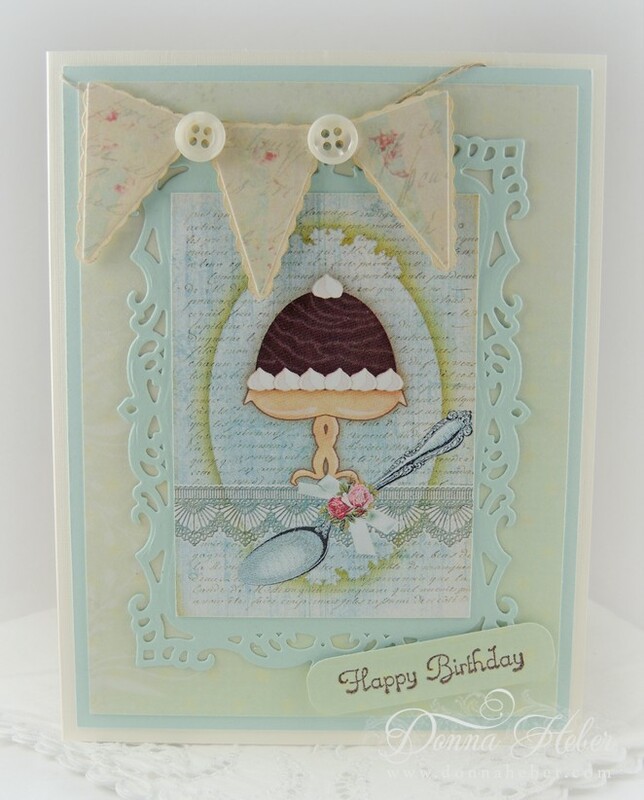 The buttons add the perfect touch- and I love the background trim for the cake. So sweet! This a beautiful card, I love all the detail. I would be honored to get this card. That is so charming! I love the details, the spoon... everything! Goodness that takes me back! Very nice. Remember Hollie Hobbie? It was huge in Holland in the 60s but I think it was British or American. So sweet Donna! I love the detail on the frosting, and your soft, subtle color combination. Stamping was all I needed to hear for me to head straight to your blog from your profile. The card is great! Your card is adorable, Donna. The intricacy and time spent amaze me. It's obvious you enjoy doing this. 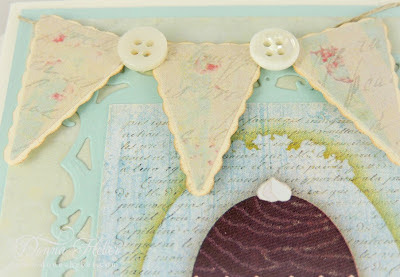 What a stunning card, Donna--I love the detail of the banner and the buttons! I love the little details in the banner. Someone will be very pleased to receive this. Gorgeous work! Love the colors and all the shabby chic elements! Love the birthday card, Donna. The colors are so pretty together. Thanks for the tutorial. I just love this card Donna! Gorgeous design paper, delicious image and fabulous design.